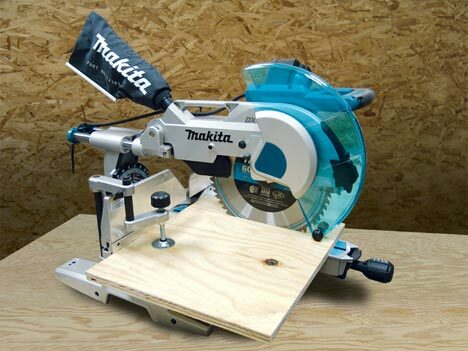 Makita's 10” 4-rail saw has been out for a while now, and receives lots of praise around the internet so it comes at no surprise that Makita has moved up to next logical step. The new LS1216L is built off of the same design as the 10” model, so many of the features are the same. The biggest difference is of coarse the added cutting capacity the 12” version offers. The 4-rail design offers a more compact footprint without the loss of any cutting capacity; this allows the saw to cut 15” material at 90 degrees. Even more impressive is the saws ability to cut 8” crown and 6 1/2” baseboard vertically nested. Cutting capacity at 0° 15"
Cutting capacity L/R 45° 10-1/2"
Crown molding capacity (vertically nested) 8"
Baseboard at 45° (vertical) 6-1/2"
Overall dimentions (L x W x H) 31-3/4" x 25-1/4" x 28-3/8"